We (K V RAMANA & G V RAMA PRASAD) decided to prepare ALL IN ONE, A Complete Book of Formative Assessments for the help of all Physical Science 4 Ever blog users. As a part of that book we presently prepared this for “ALL IN ONE, Formative Assessment 1’’ book. 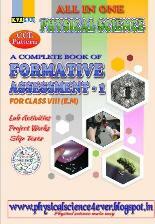 We will try to give you a complete ALL IN ONE, A Complete Book of Formative Assessments for F.A 2, F.A 3 and F.A 4. Working towards improving the children's learning through observing and recording their performance, while they are participating in teaching learning processes like project works, lab activities, slip tests, etc., is called Formative Assessment. It is used by the teacher to continuous observe children's progress in a non-formal way and in supportive environment. It gives regular descriptive feedback, rather than marks and grades, which give a chance for the students to reflect on their performance, take advice and improve upon it. For 8th Class Formative Assessment Syllabus as follows. Students should read thoroughly Force (Unit: 1) and Friction (Unit: 2). They must read the complete lesson and try to understand deeply, the concepts in each lesson. They observe the figures given in the text book and ask him some questions about figures for easy answering CCE model questions. Aim : It explains why we perform the experiment. Apparatus : Here we should mention required apparatus and materials, Chemicals. For class 10 formative assessments have to evaluate through four measures. the private use. No one should use this for commercial proposes.